Laptop anti-theft software (1-year subscription). Is there a better alternative to GadgetTrak? Is GadgetTrak really the best app in Security category? Will GadgetTrak work good on macOS 10.13.4? GadgetTrak Laptop Security... Think about the things you have on your laptop right now: Countless photos, financial records, software, music, videos, etc. The hefty price tag on your laptop is probably dwarfed by the value of the information on it. GadgetTrak dramatically increases the likelihood of finding your laptop, by pinpointing its location, and even sending a photo of thief. Wi-Fi positioning - Using Wi-Fi positioning technology, GadgetTrak can pinpoint your laptop's location, usually within a few meters! Webcam support - Snap a photo of the thief to collect crucial evidence that the police can use to get your laptop back. Location notification - When tracking occurs, you'll receive an email with detailed information about its current location. 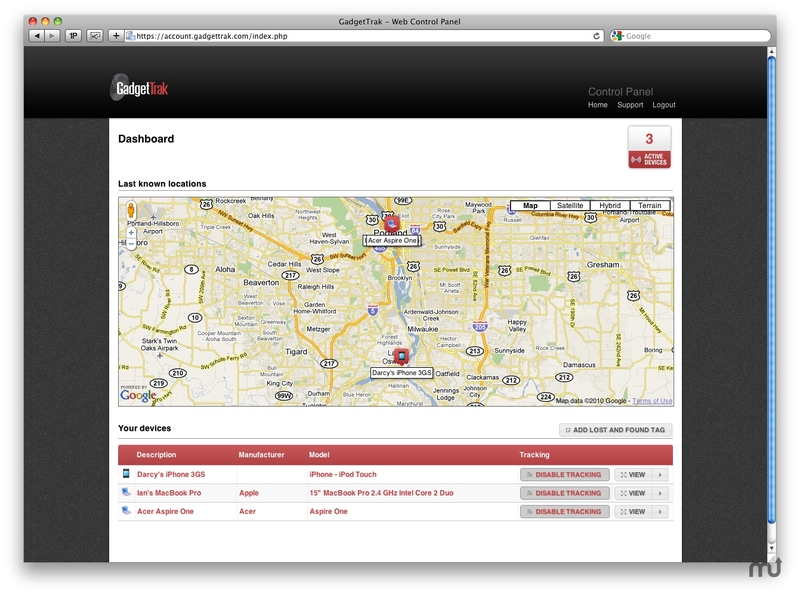 Track on-the-go - Since the GadgetTrak Console is web-based, you can track your devices from anything with a Web browser! Tamper proof - Once tracking is activated the software settings cannot be modified unless deactivated. Secure data center - GadgetTrak's data center is in a highly secured tier 4 facility, including on-site armed security around-the-clock. Only you can access your location reports and Web camera. All images, network information, and location data are sent directly to you from your computer system.